When was the last time you had a popsicle? How about a homemade s’more? I think it’s been a good 25 years since I had the frozen delight. Remember the days when the ice cream truck would ring the bell in the neighborhood and all the kids would rush out? The Push Ups and Bombsicles were my favorite! Since time is short and my days are numbered on this earth, I decided I needed to make a Summer Bucket List. Yes, it’s the proverbial list of “things to do” this summer. No, I actually look at it as a list of precious things to experience with people I love. Said bucket list will ensure that I don’t just go through the motions this summer, watching days turn into weeks and by the time I know it, precious months will have gone by without making memories and doing what is really important. I want to make the most of the days I’ve been given this summer. I’ve lived in this city my entire life and there are some iconic things that I’ve never experienced here. I want to make the most of it. In one month, I will attend two family reunions. I plan to be that annoying girl, taking everyone’s photo! In this day and age, families don’t do this anymore. I want to remember. I want to savor this time with family. Every evening thousands of black bats take flight across Austin’s Lady Bird Lake. I’ve never seen them (close your mouth now)! This summer I’ll get to witness them in the air and in grand style while cruising the lake on a double decker! I can’t wait! Making homemade granola bars and s’mores are on the bucket list too, none of which I’ve ever made. I’ve already indulged in the mango popsicles! Bats are quintessential Austin. So are food trucks and great museums. The city is home to the Blanton Museum and an event called Trailer Park Tuesday where a bunch of food trucks gather in the park with live music. I plan to take advantage of some of my cities ‘top ten things to do this summer’ including symphonic music in the park. A little bit of travel is on the list too with another trip to the sunshine state of Florida! I can’t wait for that either! In my opinion, the beaches there are just as fantastic as any in the Bahamas. Whether the beach, the lake or the sprinkler, put some water on the bucket! I’ve been saying for years that because my birthday falls during the holidays, I should celebrate a half birthday. This year I’m making that happen with a summer celebration. Bubbles are on the list, just because they make me happy, and hey, why not? I’ll also head over to the UT Observatory for a little star gazing on a clear Texas night. Never done that before have you? Whatever you love, whatever you’ve thought ‘oh I ought to try this or that’, I say there’s no time like the present. 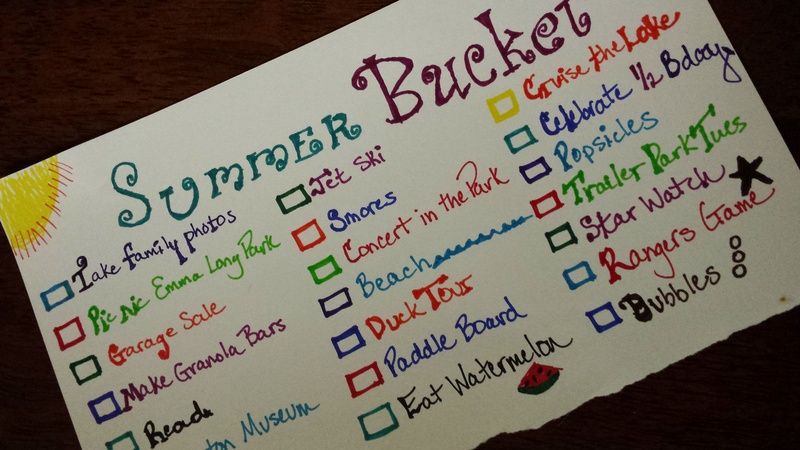 How about a bucket list to get you focused? We get one pass at this life. We won’t get this summer back.